setting the TPS baseline is the first step. Remember, all connections to the throttle must be removed before adjusting the voltage. 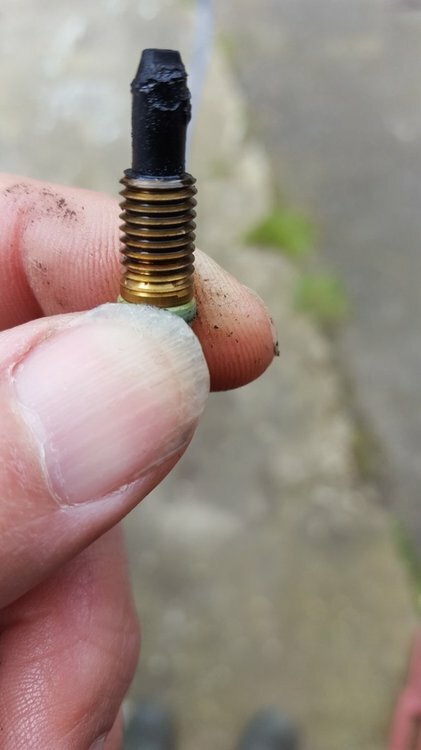 The valve play should be at least 0.2mm for Intake/Exhaust. 0,3mm is my recommendation, the V11 camshaft has very! long ramp-up slope, >100°. The standard setting will result in sligthly opened valves in that area, resulting in mean pressure loss and decreased valve cooling. Once this is done sync the throttles in idle, try to keep the bypass screws completetely closed and do the sync with the throttle stop screws. CO trim should be set to 0 initially and only be changed if you have no means of actually measuring AFR. GuzziDiag always works, but a KKL adapter with an original FTDI chip is needed. There a lot of counterfeit chips in the market, they will mostly not work. Thanks Meinolf. I have ordered a KKL lead with FTDI usb in. On further investigation, I have disconnected the TB linkage and backed out the throttle stop fully, made sure the fast idle cam is not touching and saw the TPS baseline drop from 375mV to 80mV. I now understand what's what! So I will set the TPS next and then do the balance. 2001 V11 Sport, 2002 Aprilia Caponord (sold), 1983 850 LeMans 3 (sold), 1983 Yamaha 650 Turbo (sold), 1972 Honda CB750 (sold), 1981 V50 3 (totalled), several Vespas and one Lambretta. Back off the RH throttle stop. Unless you have some super high mileage bike where everything is worn out and sloppy, using both will make you crazy. Sync using white knob at idle. Like I said, some frown at this. Guess what? If they are synced at idle, it will be synced off idle. When the throttles are open (>3k) the white knob needs to be moved a lot to make any difference in vacuum. This is because the small adjustments the white knob makes gets lost in the large flow of air coming through, and tiny imbalances in throttle vanes will be hard to see on any kind of meter, even the expensive one I bought. ﻿You can turn the white knob and the throttles will appear to be in balance at higher RPM's. But they're not, which you will see when it drops to idle. Then you can use the bleeds to try to even it out, which is what I did, and then it idles worse than ever. Try "JB's" method, and sync the throttles at idle using the white knob. Turn 1/8 and blip throttle and let it settle. Keep doing this until it smooths out and is in balance. The idle will probably creep up as it smooths out (you can adjust this later usi﻿ng the LH throttle stop screw). It will never be perfect but you can get it close. Check "off idle" RPM's as you get it smoother, I b﻿et they will be in sync too. I had a misfire / backfire that I chased on my Rosso Corsa for 3 years. If your bike has the balance pipe in the front I'd check for air leaks into the exhaust first. I found the gaskets rotten and exhaust coming out. I figured it might mean fresh oxygen getting in between pulses and causing the backfire once the exhaust heated up. I ended up cutting off mine, cleaning up the headers, making plugs out of the the crossover tube and having a local Stainless welder weld them up. After a trip to a local Duc tuner my problem may have been fixed. It only backfired when the weather got above 80 and the engine was hot so I'll know for sure on a trip to Tuscon Arizona in May. Thanks JB! That sounds like a plan! Yet Another OBD Cable arrived today, so will see if it works ok with GuzziDiag. Understand what you're saying about balancing at idle. I'm a m/c newbie so learning a lot. My other vehicles tend not to need much tinkering with to get running right. Usually worst case is a carb stripdown and clean to clear blocked jets etc. Will update when I get the TPS set, CO set and balance set. Many thanks for all the help! Well today I got a KKL lead and despite being very cheap and not having the FTDI chip in, as advertised :-( , it worked perfectly. Set the TPS at 159mV, locked it off. Put the balancer on. This was quite tricky to set as there is a bit of slack in the TB linkage. Need to sort that. Anyway, go it as close to balanced as I could. Waited for the engine to warm up and then set the CO. It was set at -19, so set it to 0. Just taken her out to see what's what. Bloody hell! What a difference! Really pulls now and not a hint of missfire. My previous rides were a dissapointment as the bike didn't seem to be any more powerful than the 650cc training bikes I'd been riding. Now you can really feel that extra 30hp. So many thanks for everyone's help! Will progress getting a TPS breakout cable instead of using the pins method. When they are right, man they are Right! The breakout harness is a great mod, makes it super easy to check the TPS on a regular basis. Now that's it's running right, next up is a good old "Italian Tune Up". Add some fuel system cleaner of your choice, warm it up and screw it on..!!! Czakky's right: when they are sorted, they are great!